Crime saga Yakuza 3 takes players to the belly of the beast, giving them a chance to view the underworld up close and personal. But more than hostesses and mahjong was cut from the game, including an English speaking class. The English conversational industry is, according to Tokyo Vice writer Jake Adelstein, "one of the industries that the yakuza dominate in Japan". He is quick to point out that most English schools in Japan are totally legit and the teachers are decent folks. "It speaks highly of the game creators that they included the sequence," Adelstein tells Kotaku. "They really do their research." It's been known that the English conversation scenes were cut from the game, along with hostesses, quiz games and mahjong (here is a list of edits and cuts). But, it's worth putting the English industry into context. Japanese students must learn English through high school. College entrance exams even have an English section, and the majority of students continue studying the language during university. However, many Japanese cannot speak English as the focus in school is reading and writing. Hence, the English conversation business. "English conversation schools were and are still run by anti-social forces, some of them essentially being yakuza front companies." "What's not well known is that a number of English conversation schools were and are still run by anti-social forces, some of them essentially being yakuza front companies," Adelstein writes on Japan Subculture Research Center. "There are numerous ways these schools can be used as a semi-legal con-game." Some of those include making students believe that they can date their teacher, or having students pay a huge initial sum upfront and then refusing to return the rest should they quit or even creating a pyramid scheme that has them try to enroll others in the school. Adelstein points to the most famous incident, the fraudulent practices of the Nova English school. The company's actions were so bad that the Ministry of Economy, Trade and Industry had to suspend part of the company's activities. "Nova was allegedly connected to the Yamaguchi-gumi and in the past had used yakuza thugs to violently break-up attempts by the english teachers to unionize," adds Adelstein. "The scandal resulted in Nova's bankruptcy and the loss of hundreds of jobs." Last December, former Nova CEO Nozomu Sahashi was sentenced to two years in prison. The Osaka-born Sahashi created the school's English learning method, apparently based on his time living in France. Sahashi was actually born "Nozomu Saruhashi", but changed his name because "saru" means "monkey" in Japanese. 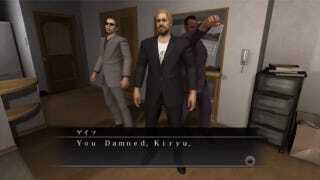 Yakuza 3 dives head first into an English conversation scene. In one cut sequence, ex-yakuza boss Kiryu gets interested in learning English, but then discovers it's a pyramid scheme, resulting in Kiryu kicking the crap out of the foreigners that run the scam. Most likely, the text-heavy sequence was cut from the game due to the same reason that things like mahjong, hostess bars and the quizes were cut: localization issues. Last March, Sega said, "we had a tight schedule to abide by for localizing and releasing Yakuza 3 in the west" and that "due to the limited time we were given we had to leave certain bits of the game out". The mix-match of the English teacher's pidgin Japanese and Kiryu's English bits could prove challenging to localize into the English version of Yakuza 3. Adelstein explains why English conversation schools are and always will be a good business for Japanese organized crime. Many operate on the same principles that are used in hostess bars. "Just like a hostess club there is the possibility of actually dating one of the teachers dangled out as bait to keep the customer coming back," he states. "Many companies portray their schools as a place where Japanese men and women can have a chance to date an attractive foreigner." And the foreign teachers, Adelstein continues, are often brought in under stringent contracts that not only binds them to their jobs, but makes them easily replaceable. "In some cases, their apartments and travel expenses are loaned to them in advance, essentially indenturing them to the company before they even began to work," he adds. And often the apartments are owned by the companies as well. Nova was an extreme case, however, and most teachers are just regular folks, working regular jobs.